After having tooled around with a USB Linux version using your multi partitioned flash pen drive, you might find it necessary to revert it back to a single fat partition (restore the flash pen drive to it’s original state) that can again be read by all computers. For those working from Linux this task can easily be accomplished via the following Linux tutorial. Windows users can Download and use either the SP27608 HP-USB Format tool or follow the Windows instructions below that utilizes the newer HP USB Format tool. WARNING: This process will delete any information that is currently stored on the USB key. Proceed with caution! A. First we need to delete the old partitions that remain on the USB key. and note your USB drive letter. B. Next we need to create the new partition. 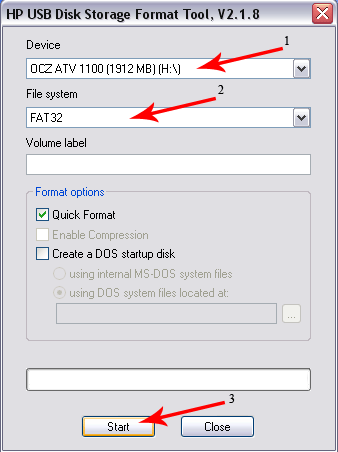 C. The last step is to create the fat filesystem. That’s it, you should now have a restored USB key with a single fat 16 partition that can be read from any computer.